Only the best technologies and processes can make domed labels look like a million bucks! Integral Labels Pvt.Ltd., doming capability is just one of the label enhancements that will create that one of a kind look for your labels! Doming can be supplied in a very hard or quite flexible finished state. 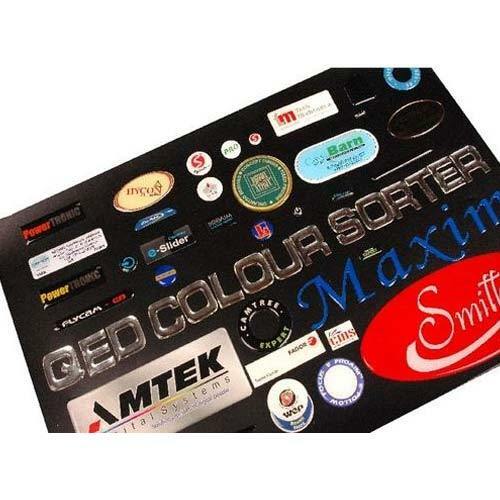 Using our state of the art systems, we can produce everything from small button appliqués to large durable logo labels. Our doming production capabilities include screen, digital and litho printing. We can emboss, laminate and die cut your domed labels, including perimeter die cutting and doming for special shapes. We would like to introduce ourselves as a company that manufacture, supply and export specialty Labels, primarily for the Electro Mechanical Industry. We manufacture labels with base materials such as Anodized Aluminum, Brass, Stainless Steel & Self-Adhesive Polycarbonate & Polyester. We also manufacture Vinyl Labels, Bar-coding Labels and Dome Labels. To utilize our capacity to the fullest, we also undertake Anodizing Job Work. As you are aware to meet export criteria. Our Labels meet High quality standards, set in house quality standards as well as extremely critical customer requirements. We are confident of meeting all your quality requirements with respect to your labels. We export over 20% of our products to several countries including the Netherlands & UAE.